I've surpassed myself and managed to squeeze yet another team mate vs. team mate matter out of the Suzuka race. Well, a variation of one anyway. Much of the focus afforded on the Sauber team in recent times has been on Nico Hulkenberg, naturally. But less widely noted has been that the other Sauber pilot has been coming onto a game too. 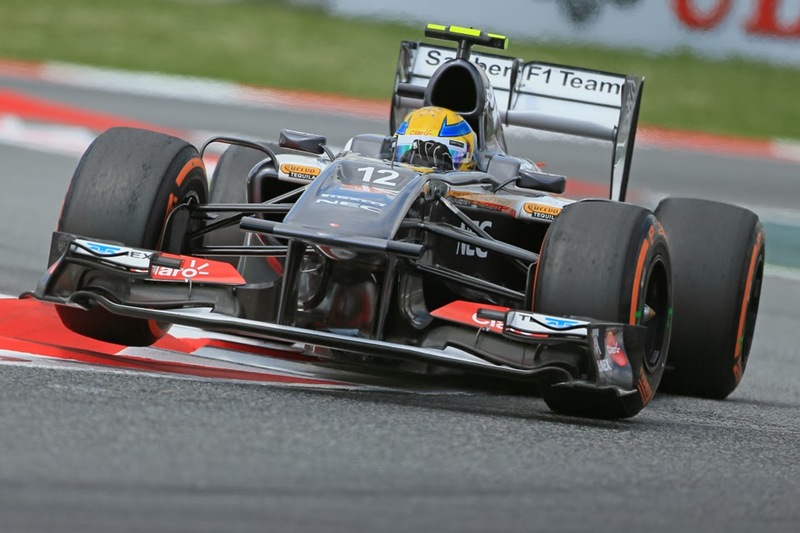 Esteban Gutierrez arrived in the sport this year with a rather (in my view) mean 'pay driver' tag. OK, his access to Mexican wealth no doubt oiled the wheels and his GP2 form was a little patchy, but third place in the GP2 table last year, in addition to GP3 and Formula BMW championships, at least suggested he wasn't an idiot. But for much of his freshman year in F1 the only thing that he distinguished himself by was an egregious error in the Chinese race, driving into the back of Adrian Sutil. Otherwise, it was mediocre runs and finishes far from the top ten pretty much all round it seemed. But recently, and quietly at first, he's been improving. In both Singapore and Korea he qualified in the top ten, in the former case making Q3 with the seventh fastest time at what is possibly the year's most taxing track. While in the latter he oh-so nearly scored his first points after a comeback drive following being shunted down the order by someone else's contretemps on lap one. But in Suzuka it finally came right for him, getting his first points, and a major haul of them with seventh place. In so doing he was not far from the vaunted Hulk's pace in qualifying and the race, as well as showed immense calm and maturity when under attack from Nico Rosberg late on in addition to earlier showing a willingness to go wheel-to-wheel with the likes of Felipe Massa. 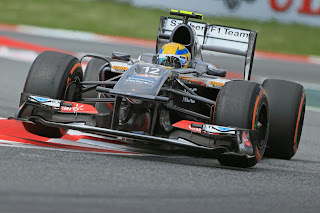 Amazingly, it also marked the first occasion on which any of the five 2013 F1 rookies troubled the scorers this season. But equally we often forget how - as an unintended consequence of the recent testing restrictions - things are very difficult for F1 rookies these days. It puts me in mind of being told something like that these days a driver in their debut campaign has to wait until they've got a whole ten race weekends under their belt before they have the same number of kilometres in a contemporary F1 car as Lewis Hamilton had before making his F1 debut in Melbourne 2007. And probably not entirely unrelated, it tends to be around this point that Gutierrez and others in his situation start to do themselves justice. It doesn't help at all either that many watching on, including teams, are guilty of judging drivers definitively long before they reach this stage. So, what now for Gutierrez? With it by now assumed that young whipper-snapper Sergey Sirotkin will be getting one of the Sauber seats for 2014 this has made the Mexican's retention a bit more problematic. Presumably a much more experienced driver in the other seat would make it much easier for him to be kept on. In this vein, Martin Brundle a few weeks ago described a possible Gutierrez-Sirotkin pairing as the blind leading the blind. And yet Sauber has been here before. Rewind back to 2001, then its driving line up was made up of a young driver with but one year's F1 experience, and a debutant with a mere 23 car races to his name, and many expressed doubt in advance of his maiden race on his suitability for receiving a Superlicence. And from what I recall that year worked out OK for the team. Indeed it was rewarded with fourth place in the constructors' standings - only in its years backed with BMW megabucks has the Hinwil team ever matched that. As a previous goes it doesn't seem like a bad one. Buddh Preview: Out of India?